At long last. We have been waiting patiently for the signs of spring. The peewits (lapwings) and skylarks turned up at the beginning of March. Other visitors were still eagerly awaited and they've finally arrived. 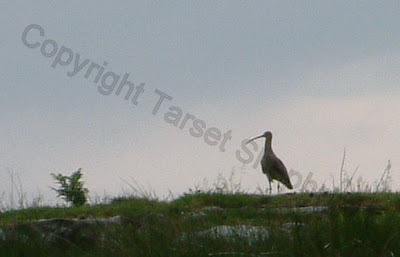 The curlew - it's back! I have to admit to having heard it on numerous occasions, very often just wishful thinking or else I've noticed starlings near at hand and they are grand mimickers of sounds. The 15th March was the day. I not only heard, but also saw, the curlew - no doubt about it, not my mind playing games or anything else for that matter, I even had a witness to the event. Apparently the golden plovers are also back. At long last it seems we have pulled through the winter months, our ground nesting birds have returned from their winters holiday over at the coast. It is good to see and hear them again. The frogs are gathering up and croakingly crooning to one another. The frosts have given over for the time being. The wind is from a warmer art (direction), although quite strong with it. The days are truly lengthening, (light at 6am now). All we need now is for the grass to return, for those with short memories that is the green stuff which usually grows in the countryside (and gardens for that matter), it has been missing from view for far too long, it's return is long overdue, optimism is running high that it may well return before the lambing gets going - lets hope so.